Comrade Bhuvaneswaran (37) who fought against the land mafia of Chennai was brutally murdered on Tuesday (January 10) by goons. Thousands of people had purchased land near Avadi (an important suburb of Chennai). A few anti-social elements had occupied the land illegally and claimed that the land belonged to them. They also made false claims that this was the property of a manor (Zameendar) and they were the true owners of the land. They further went ahead and started reselling the lands. It should be pointed out that the Zameendari rights were abolished in 1948 itself. If the original owners of the lands staked claims, they told them to pay money again to get back their plots. No action was taken despite several complaints being registered made to the local Police station, Suburban police commissioner.In this background, land owners belonging to a few localities came together and formed an association to defend their interest. Comrade.Bhuvaneswaran was functioning as the secretary of the association. In Morai village, near Avadi about 167 acres of land was illegally occupied by the anti-social elements. Comrade. Bhuvaneswaran with the help of the Communist Party of India (Marxist) continuously fought to reclaim the occupied lands. He successfully used the Right to Information Act to collect evidences against the illegal occupiers. He filed a case with these evidences in the court and won the case too.He got back 30 acres through this case and distributed it to the poor land owners of the region. But he could not reclaim the 10 acre land belonging to him in the same village. The case that he filed for it,with the help of the CPI(M) is still on. He continuously received death threats, asking him to withdraw the case. Seven attempts of murder were also made against his life. The local Police station did not take any action to protect him despite filing a complaint. In this background, under the leadership of CPI(M) Tamil Nadu state secretary G. Ramakrishnan a fast protest was organised on March 1 2011 in Avadi. On the same day, the illegal occupiers came forward to give back the land to the original land owners. Due to the struggle of Comrade. Bhuvaneswaran with the help of the CPI(M) the lands were returned to their rightful owners.The anti-social elements continued to hold a grudge against him. On Tuesday, January10 2012 when he was travelling on a motor bike with his three year old daughter his bike was stopped by the goons hired by the illegal occupiers and was brutally stabbed to death. Comrade.Bhuvanswarn is survived by his wife, and two small girl children aged5 and 3.
these brutalities that they aim to use as a deterrent against people protesting against their wrong doings. Comrade. 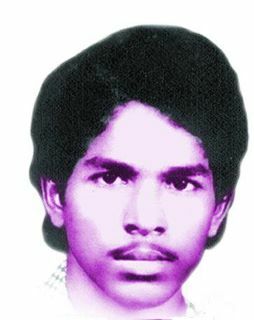 Bhuvaneswaran refused to be cowed down and legally fought with the help of the CPI(M) and won the fight. He paid with his life for it. The Anti-social elements hope to serve a warning to everybody who fights against them, through this murder. We would be failing in our duty if we let the land mafia to continue operate by instilling fear. The illegal atrocities of the mafia should be exposed and the wrong doers should be punished. That would be our homage to the martyr. Red Salute Comrade! Hello there! I simply wish to offer you a huge thumbs up for the excellent information you’ve got right here on this post. I will be returning to your web site for more soon.